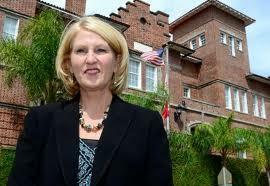 Here is Florida's Interim Education Chief Pam Stewart in an undated photo. A national search for Florida’s next Education Commissioner continues after the state board extended the deadline for applicants. But the state may not have to look too far for a suitable candidate. As Lynn Hatter reports, the apparent front-runner for the post is the person who’s temporarily filling in on the job. And she’s earning rave reviews from both sides of the political aisle. When former state education Commissioner Eric Smith resigned last year amid political pressure, the state board was disappointed with its choices for a successor. It extended the deadline for applications and eventually found Gerard Robinson. But Robinson resigned from the post in August. Now 16 people have applied to succeed Robinson. But in an emergency conference call, the state board of education basically said it wasn’t impressed with any of them. “We’re not going to lower our standards here, and if we’re not satisfied with the results at that time, I think we have a right to push that date out further," said Board Chairman Gary Chartrand. There are many who suggest the board should be looking closer to home. In fact one person in particular seems to be the front-runner for the job. But there’s a catch. She hasn’t applied for the position, and so far, hasn’t shown any interest in doing so. “Here’s Pam. Good morning… So, this is Commissioner of Education Pam Stewart." Scott dropped the “interim” tag from her title, not once but twice. And he’s not the only person impressed with Pam Stewart. When it comes to education policy choices, Scott and the Florida Education Association, a teacher’s union, rarely see eye-to-eye. But they now seem to have something in common—they both like Pam Stewart. “She understands Florida, she understands our culture. She understands what it’s like to be a teacher, what it’s like to be an administrator in our state, and we couldn’t be in better hands," said FEA President Andy Ford after a recent meeting with the Governor. And does he think Stewart should drop the “interim” from her title? “I’m not going to answer that, it could be the kiss of death for her, you know. But they’re still looking. But I wouldn’t be disappointed if she were named commissioner," he said. Before being appointed “interim” Education Commissioner, Stewart headed the K-12 division at the Florida Department of Education. Before that she was a deputy superintendent in St. Johns County and a Principal in Marion County. But whether she’s interested in assuming the title of “Florida Education Commissioner” on a permanent basis is unknown. Stewart was traveling and was unavailable to comment on this story. The deadline to apply for the job is November 30. Follow Lynn Hatter on Twitter @HatterLynn ! The state board continues it's search for Florida's next education commissioner, after board Chairman Gary Chartrand said, "we’re not going to lower our standards here." Chartrand made that statement right before the board voted to extend the deadline for applications, voicing disappointment with the 16 people who had already applied. Outside of official discussions on the matter, one name keeps popping up. Pam Stewart. Right now, Stewart holds the title of "Interim" Commissioner of Education, assuming the post after Gerard Robinson resigned back in August. The search for Florida’s next Education Commissioner is going past its deadline. The state board of education is disappointed with the current batch of 16 applicants. This is the same position the board found itself in during its last search a year ago.